James Gray's sci-fi movie "Ad Astra"
Now you need the Bob Dylan Universe in order to make a movie about a breakup? That's fucked up. I can't wait for The Dark Side of the Moon by Christopher Nolan. Idris Elba is lining up to star in the upcoming film adaptation of the Andrew Lloyd Webber musical, “Cats.” Elba joins the already-stacked cast of popstar Taylor Swift, Ian McKellen, James Corden, and Jennifer Hudson. The report says that Elba will play the character known as Macavity in the film adaptation. All I can imagine is Luthor screaming "Macavity's not there!" Fisher will star in The Shaggs, a musical feature that is based on the real-life story of the Wiggin sisters, three musically inept teenagers from new Hampshire who, in 1968, recorded one of the most infamous rock-and-roll albums of all time, Philosophy of the World. Ken Kwapis, whose feature credits include The Sisterhood of the Traveling Pants and A Walk in the Woods, will direct from a screenplay by Joy Gregory. Inspired by a 1999 New Yorker article by Susan Orlean, Gregory had previously turned the story of The Shaggs into an off-Broadway stage musical. of course i had to learn more about the Addams Family project. notice: it is the Shaggs movie that's gone cult, but not this. for it's falling apart in its very recipe. the whole spirit of the underground is lost through established names. 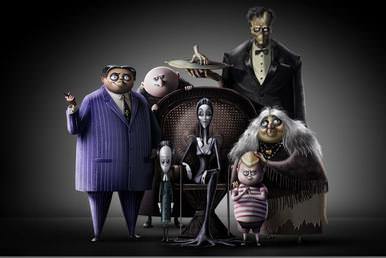 The Addams Family is an upcoming American 3D computer animated comedy film based on The Addams Family comics by Charles Addams. The film is directed by Conrad Vernon and Greg Tiernan, previously the directors of Sausage Party, and will feature the voices of Oscar Isaac, Charlize Theron, Chloë Grace Moretz, Finn Wolfhard, Nick Kroll, Bette Midler, and Allison Janney. It is set to be released by Metro-Goldwyn-Mayer on October 11, 2019, making it the first MGM film to be distributed by themselves since the 2010 comedy Hot Tub Time Machine. i doubt it'll end up trash either. the writer is a clear groupthinker. this'll be fair to middling top to bottom. wow okay, i seriously think of Trump sounding way rude. but this, just. like, can you beg for the apocalypse? For first offz, as IF we'd write off Clueless as a sacred cow, I mean, come on, YUCK. Everyone knowz that dairy is out. Secondly, for sho for thrift's sake, a rehash is environ-consho and under the proper hands, at the right time, even eye opening, so, like, replace your drama a few inches, Medea. i’m actually learning about the drama right now. it wasn’t a real request for the apocalypse, sorry if that was misleading. this isn’t actually an important matter. you wanna know what? i made the post while walking from cvs and i was like, you know what i did, i went into your theater because i was like, i'm about to make crystal clear everything's fine between us, that's right i was about to smile at you, and basically a smile always works it's kind of that easy, but you weren't there.